Entering Uganda from Kenya at the minor border crossing at Suam, we were again reminded of the immediate differences one notices on entering a new country. In this case it was the language; English being almost universally spoken here. We were now greeted with friendly, smiling little faces calling us Muzungu. Travelling on gravel we began to climb up onto the high ground surrounding Mount Elgon, and were surrounded by dozens of curious children when we stopped for lunch. They crowded close, chattering and laughing noisily amongst themselves. A crowd of kids gathered around us during our lunch stop. It was a slow drive with the road maintaining an altitude around 2000 metres and getting steadily worse, with low range required now and then. The mountain was terraced and cultivated and motorcycles were the preferred mode of transport. We saw motorbike taxis carrying up to three passengers at once! 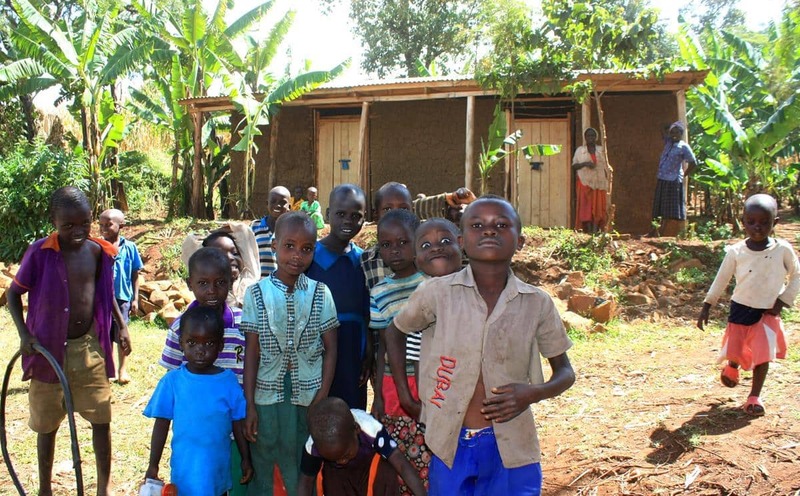 We passed through countless little villages with many buildings painted bright yellow, the corporate colour of the main cellphone company in Uganda. In between the villages the landscape is covered with banana trees as far as the eye can see, with coffee bushes growing underneath the bananas. Passing through a pine forest on the way to Sipi. We finally arrived at the lush green Moses Campsite in Sipi, setting up camp near the cliffs of the escarpment which overlook both the Sipi Falls to the east and the low ground to the north. 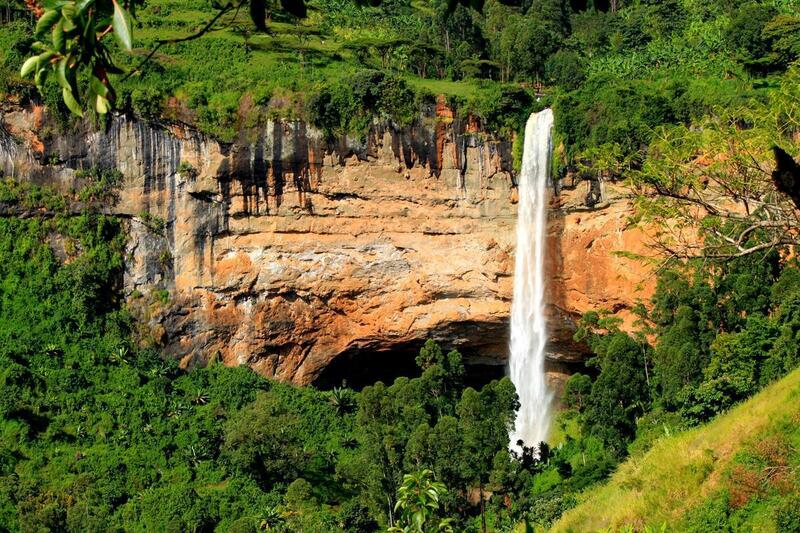 A view of Sipi Falls from the campsite. 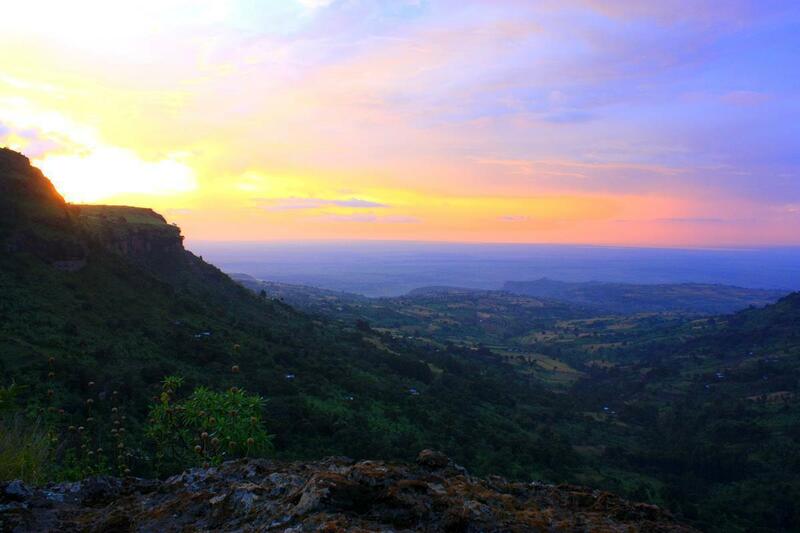 The time spent in Ethiopia, followed by the difficult drive down western Kenya had left us both very tired so we thoroughly enjoyed our two day stay high on the edge of the Mount Elgon massif. We enjoyed the changes in light on the cliff walls and the valley floor below at various times of the day as well as striking sunsets. A magnificent sunset over the valley below. 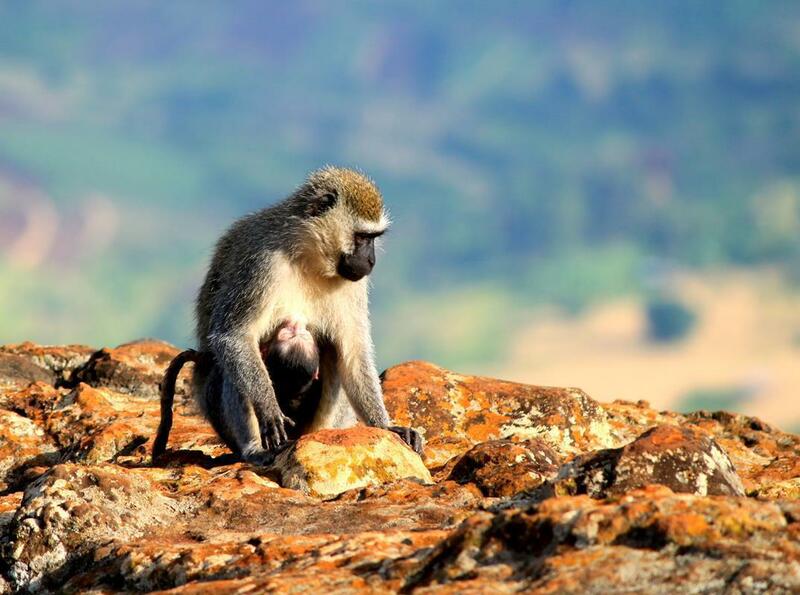 Vervet monkeys entertained us during breakfast with their normal playful pranks. A vervet monkey carring her suckling baby. It is currently the rainy season in Uganda, with showers building up in the latter half of the day. The temperature drops quickly with the rain, but it soon warms up again when the sun re-appears. Thunder heads towering over the valley floor. Thus far we had found Uganda to be highly populated with hardly any uncultivated land. We particularly noticed this leaving Sipi and driving to Jinja. As the country flattened all one could see were the rather scruffy cultivated plots on each side. A variety of crops are cultivated: bananas, rice, cassava, maize, mangos, citrus, sugar cane and various vegetables. On the outskirts of Jinja we crossed the White Nile River, passing over a long, modern bridge. In Jinja we managed to find an ATM in working order and then headed north along the White Nile (also known as the Victoria Nile) to The Haven. This lodge proved to be a true haven. The campsite is one of the best we have experienced, with excellent ablutions, which I particularly enjoyed. That alone gave us good reason to stay over for a few nights. We pitched camp on the green lawn, under shade and next to two South African registered vehicles. One, branded ‘Slow Donkey’, belonging to Stan and Ann Weakly from East London. They are on a nine month tour, criss crossing countries to make the most of their once in a lifetime African experience. It was great to meet like minded travellers, trade experiences and importantly for T4A and all its users, take advantage of Stan’s offer to download his GPS track that complement his blog. The Haven overlooks a set of rapids that run across the Victoria Nile, which is interspersed with small thickly vegetated islands, some crowded with colonies of water birds, which skim gracefully over the clear waters above the rapids. This clear tranquil, slow flowing pool speeds up on approach to the various rapid chutes and then thunders downstream; a mighty, racing, liquid locomotive. 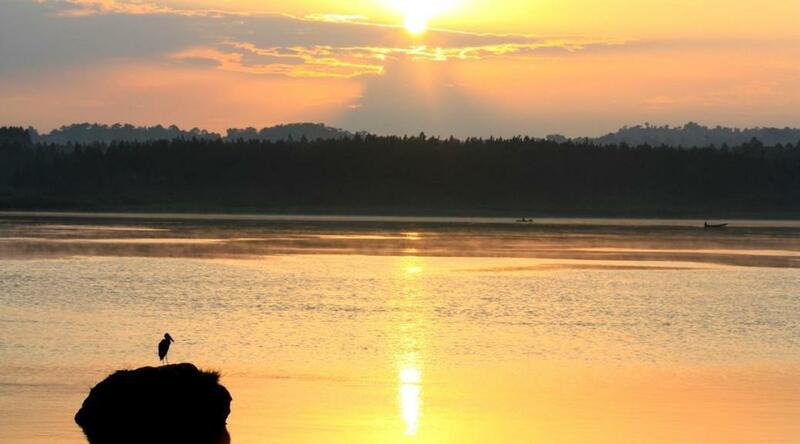 The mighty White Nile River. In the afternoon we sat on the veranda of the lodge with a cold beer shandy, mesmerised by the sound and energy of the water. Large rafts of water hyacinth would approach the largest of the rapids to be sucked leftwards downstream before being consumed by a powerful cross current, breaking them up, whipping them to the right, before bucking and rocketing out of sight. 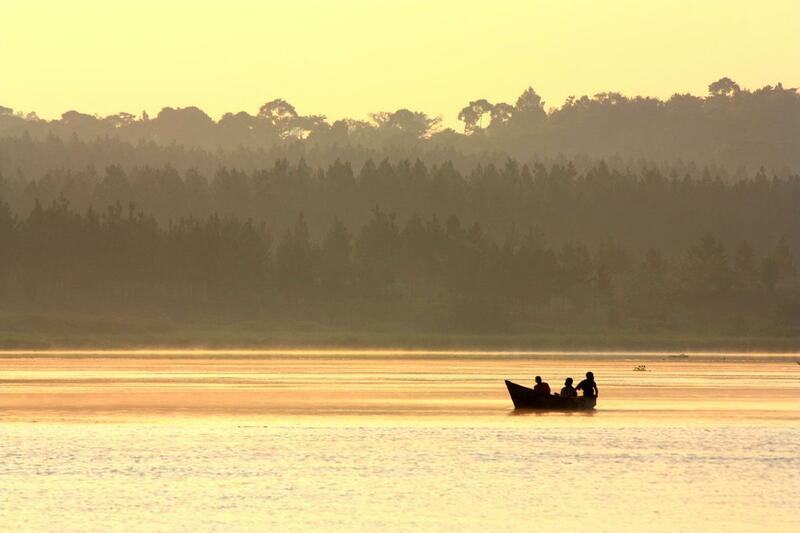 Fishermen going out early morning on their mokoros. The river and riverbank is habitat to a huge variety of birds, including East African Plantain eaters, bee eaters, fish eagles and a pair of Warblers feeding their young just three metres from our kitchen. 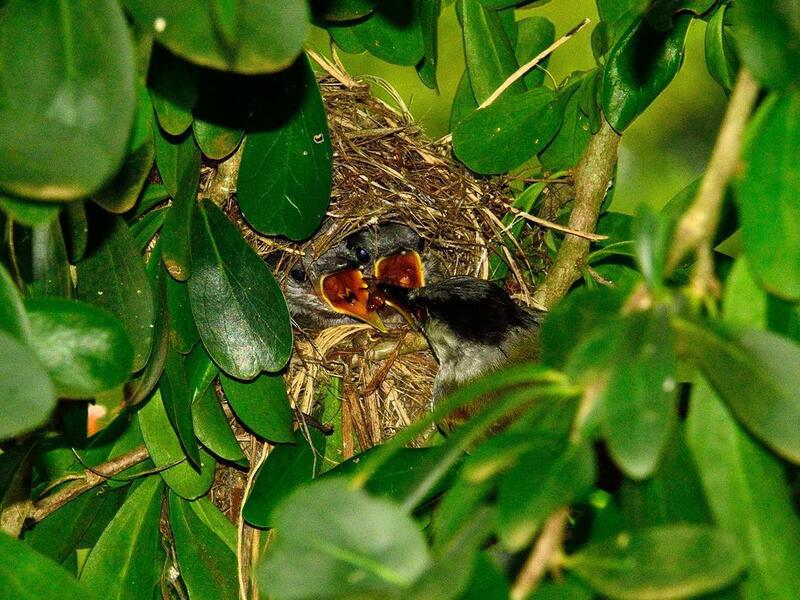 We thoroughly enjoyed the Warblers feeding their young. Shy red-tailed monkeys entertained us with their high level drops to branches far below. These primates from central Africa have black faces, a white spot on their noses and white cheek fur. The name red tail comes from their long chestnut coloured tails which are used as additional limbs to facilitate movement in the treetops. 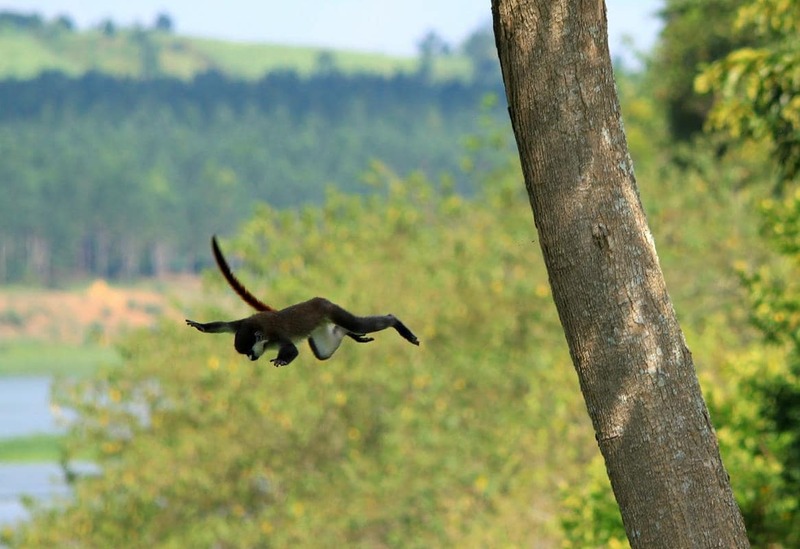 A red-tail monkey looks like he is flying down. 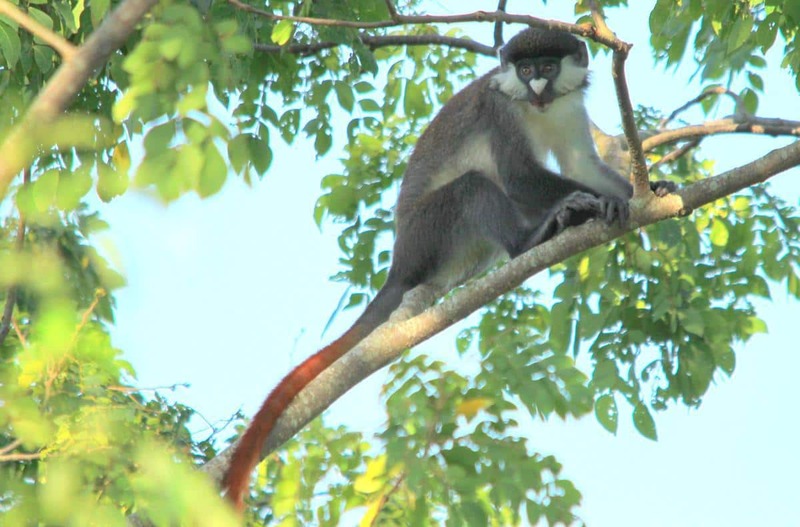 The red-tailed monkeys are quite shy. We thoroughly enjoyed the tranquility of The Haven, being lulled to sleep by the rush of water flowing over the nearby rapids and awoken by the cheerful chattering of birds and the lone cry of a fish eagle. 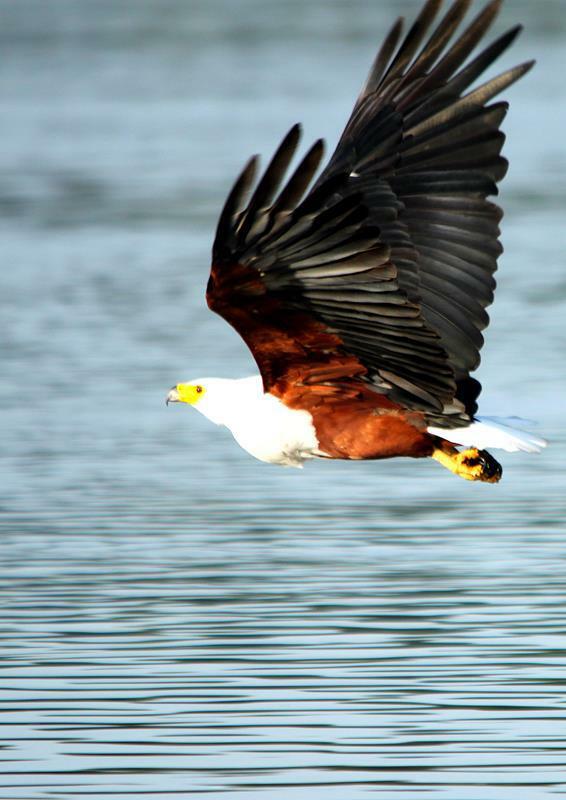 A fish eagle sweeping over the water. For the first time in two months we managed to get some exercise. The small kiddies of the nearby village were particularly happy to see us running past. Even toddlers clapped their hands and danced to the rhythm of Muzungu, how are you? or Hallo, how do you do? Moving on to Kampala, we began to feel that unlike Ethiopia, where the drive was the most rewarding part of the journey, Uganda was more about the destination at the end of the drive. 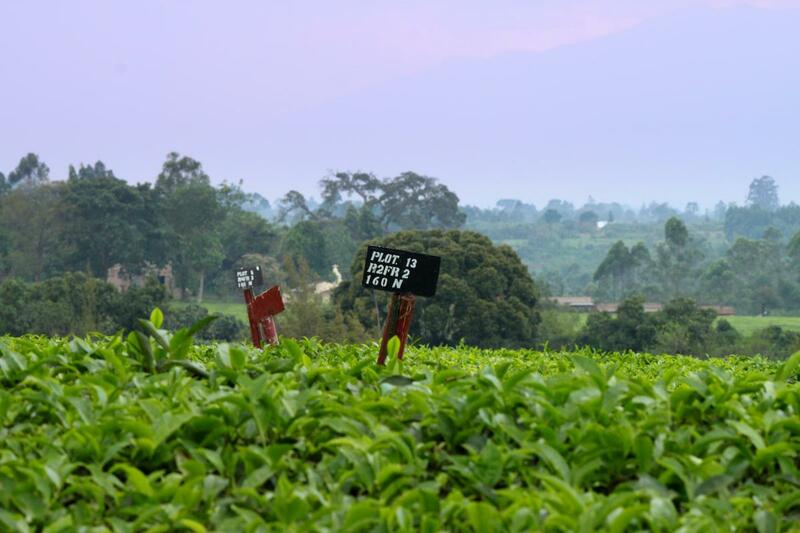 Initially this part of the country was flat and cultivated, holding little appeal for us until we reached the Mabira forest and shortly afterwards neatly trimmed tea plantations. 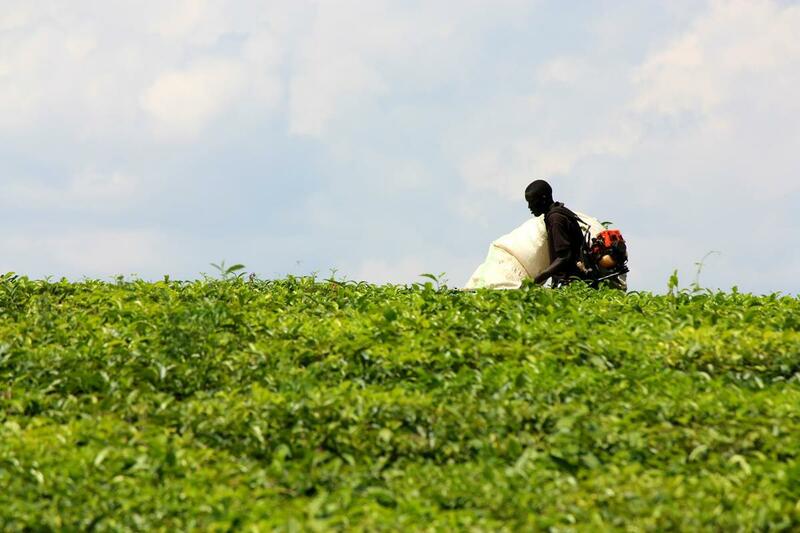 A worker harvesting young tea leaves. We restocked our larder at the local Kampala Shoprite and then drove to the Red Chilli, where with rain threatening, we set up camp. We had been concerned that our deep cycle battery wasn’t holding its charge as well as previously and whilst doing his periodic vehicle check, Pete noticed the battery sitting at an odd angle in the engine compartment. Both battery holder steel supports had snapped off and the chassis nut which also anchored it in place had pulled out. The subsequent bouncing had torn a large hole in the body of the vehicle above the left wheel. Fortunately the battery holder had not yet chafed right through a nearby hydraulic pipe on which it rested. Considering the weight involved, the only option was to devise two additional holder attachment points and repair the three that had failed, all of which was done the next morning at a nearby street side welding shop. Subsequently the performance of the battery, again horizontal, reverted to normal. We realised again that after market fitments pose significant risk to a vehicle, often failing and in the process jeopardising its basic function. 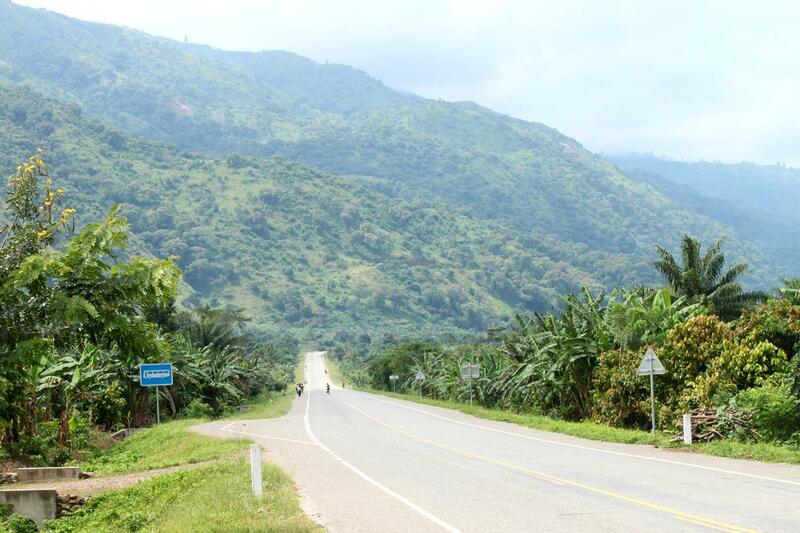 Our next leg took us near the western edge of the country, bordering with the Democratic Republic of the Congo and near the Rwenzori ‘Mountains of the Moon’. 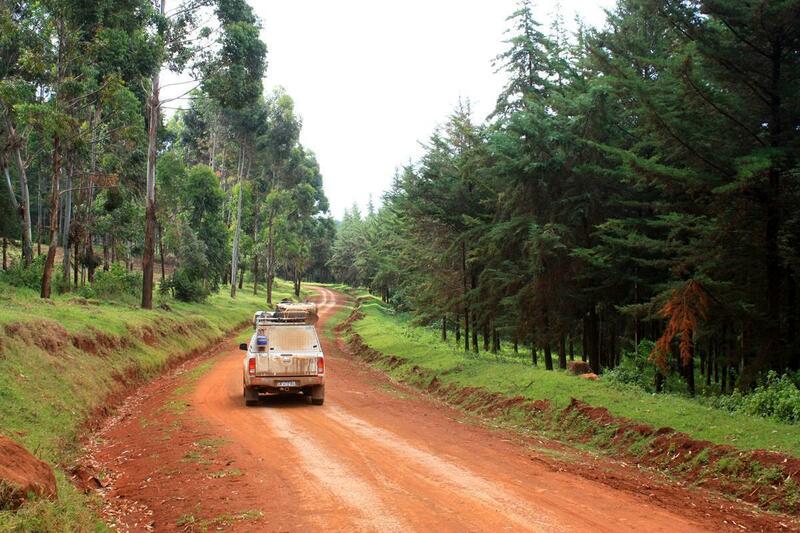 Again the journey was uninspiring until we reached the lush virgin forest of the northern tip of Kibale National Park and then onto a short cut through the beautiful Kiko Tea Estates. 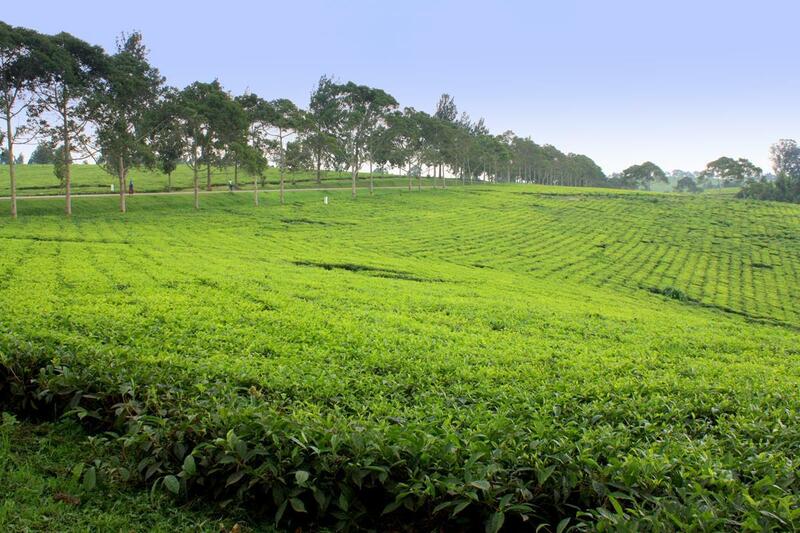 Here lush tea bushes clothe the rolling hillsides, trimmed smooth like a curved bowling green, the uppermost new leaves being harvested to contain their growth to about waist height. A neatly trimmed tea plantation. Only the new leaves are harvested. The area into which we drove, south of Fort Portal, was volcanically active about 10 000 years ago. A crater field of about 20km long incorporates some 30 small crater lakes amidst the farmlands. We set up camp under shade in an idyllic setting on the edge of one of these steep craters surrounded by virgin forest with lawn underfoot. The original Nkuruba Community Camp, overlooking Lake Nkuruba, was outstanding with good facilities and friendly, welcoming staff. From our awning area we looked down to the mysterious green waters of the lake, whilst Guereza and Vervet monkey bounced in the trees above; the latter always keen to raid our foodstuffs. 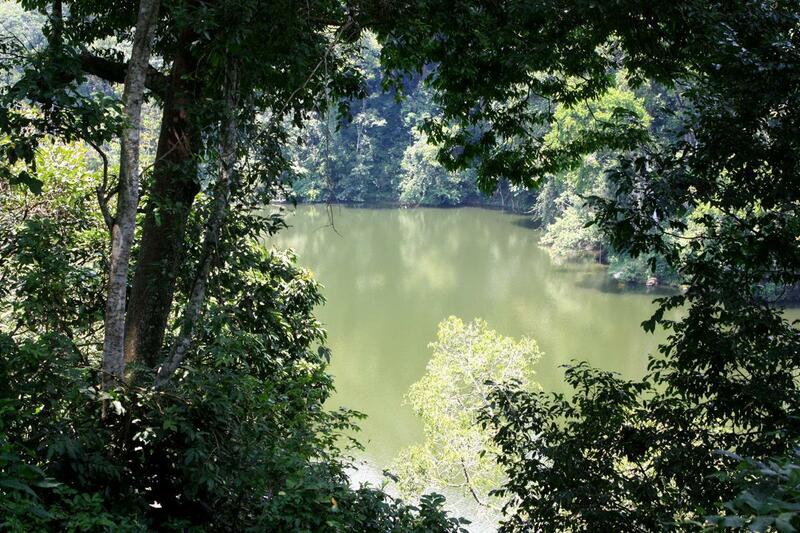 Looking down onto the mysterious, dark water of Lake Nkubura. 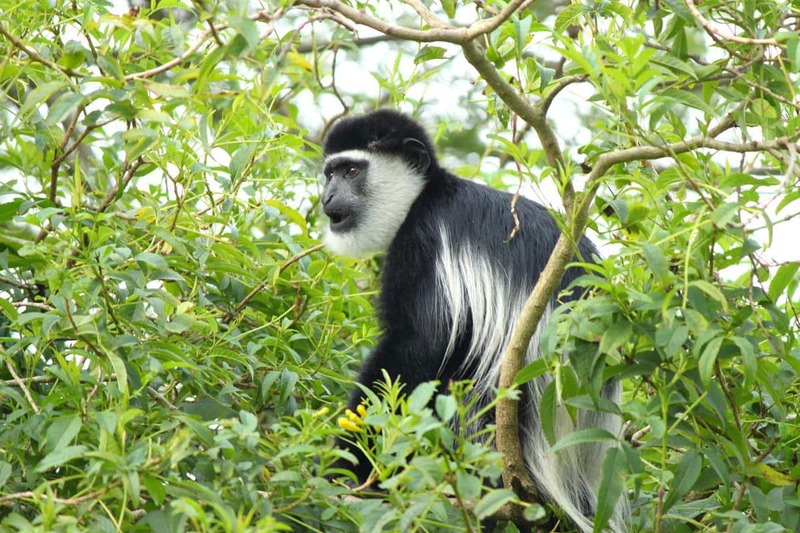 Guereza monkeys have long, white hair on their backs. 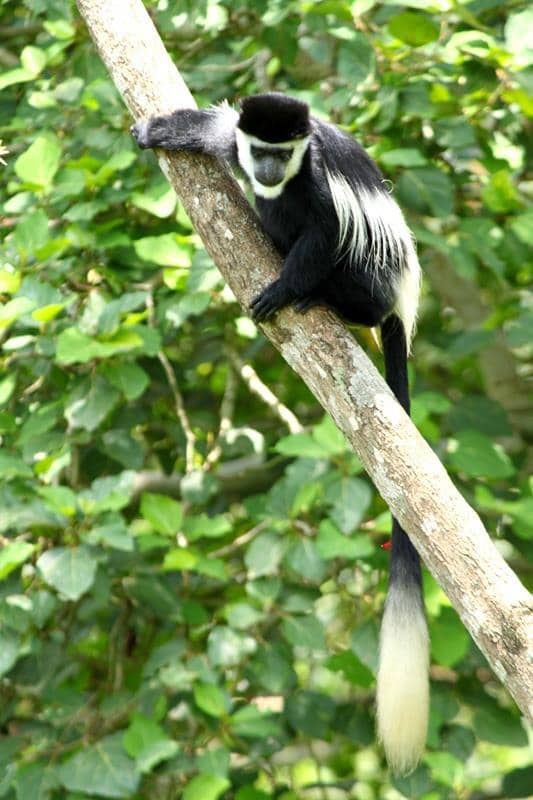 Guerezas have white bushy tips on their long black tails. Reading that the drive into the Semliki Valley followed a spectacular road hugging steep slopes, we confirmed that there were no longer DRC guerrillas active in the area and headed north. Perhaps again being spoilt by Ethiopian scenery or the fact that the road was now tarred, we felt that the guide book was overgenerous in its praise. Passing through a narrow valley which opened onto the floor of the Albert Rift Valley. Heading towards the Sempaya Mountain. However the outing was worthwhile as we returned via the Buranga Pass. The GPS showed a multi hair pinned road over the mountain, and mindful of our recent near miss in the Ethiopian mud, we resolved to drive only as far as was prudent. However, the quaint, grassy jeep track turned out to be excellent, giving us clear views over the Semliki River a few kilometres away and the adjacent DRC. 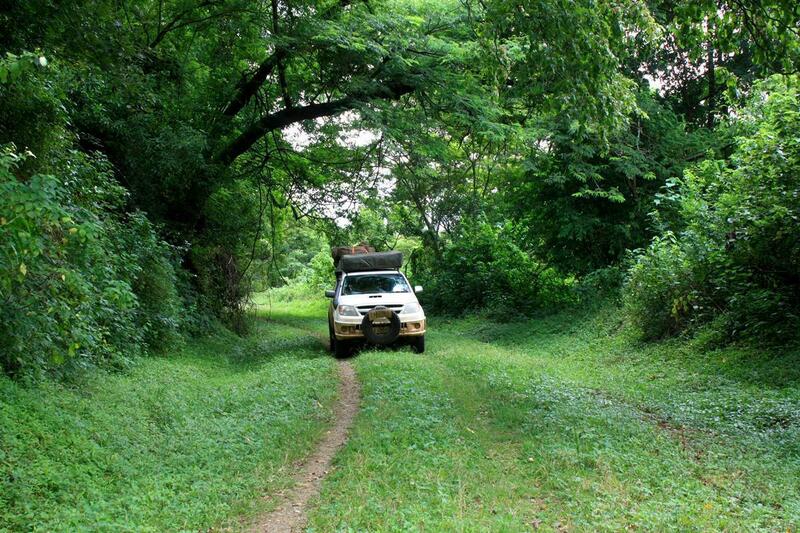 The grassy jeep track of the Buranga Pass is seldom used since the new tar road was built. Returning to the crater area we pitched camp at Rweteera Safari Park on Lake Nyabikere to spend two nights just a few metres from the water. 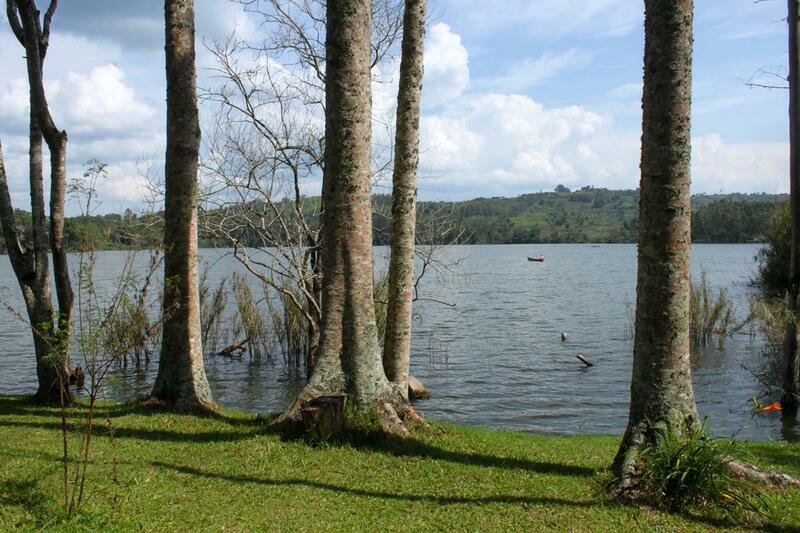 Lake Nyabikere, one of the crater lakes in the Ndali-Kasenda crater field. I absolutely love your pictures, wow. Surprised about the language difference you noted. I always thought Kenya was also very English. Nice story, nice photographs. Especially that fish eagle. Focus set on ‘tracking’? 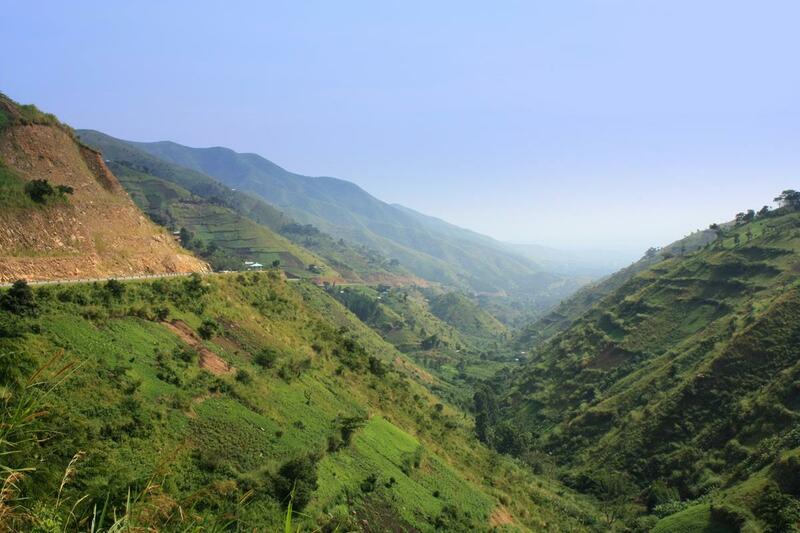 You write: ‘Moving on to Kampala, we began to feel that unlike Ethiopia, where the drive was the most rewarding part of the journey, Uganda was more about the destination at the end of the drive.’Big difference! Apparently you can’t have them both. I love to follow up your logs. Well done Jarin.